The Shroud's latest base of operations, the Coil was constructed in a previously uncharted section of Wild Space. When the Eternal Empire rose to power, the Shroud moved his compound to Obus VI to monitor Zakuul and influence the politics of Wild Space. The planetoid that houses the Coil is surrounded by the strongest scrambling field credits can buy. This field prevents any communication without the Shroud's consent, but also leaves the entire planetoid undetectable to scanners, probes, and holo-cameras. The Coil's three layers each have their own security clearance. Low-impact operations are run on the asteroid level and high-risk missions occur in the underground volcano level. Staff are prohibited from moving between levels, or even interacting with staff from other levels. The capital city of the Imperial homeworld of Dromund Kaas is one part massive skyscrapers and one part impenetrable fortress. 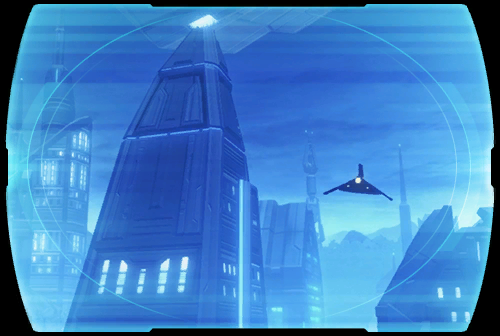 It is home to the Citadel, where the Sith's Dark Council once lorded over their followers before their dissolution during the conflict with the Eternal Empire. The Citadel also houses the headquarters of the Imperial military and Sith Intelligence. The first Sith to arrive on Dromund Kaas founded the city as their eternal sanctuary among the gorges and ravines of the jungle world. Over the centuries, its population grew into the millions--proud Imperials working toward the glory of the Sith and slaves submitting to Imperial will.